The name Harmattan originated from or is related to an Akan cognate. Akan is a language spoken by Ghanaians and Surimese. 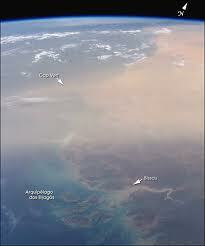 Harmattan passes from over the desert it picks up fine dust particles (between 0.5 and 10 micrometres) Harmattan season is a characterized with dry and dusty, and it has been discovered that Harmattan is a West African trade wind. Harmattan usually storms the south from the Sahara into the Gulf of Guinea between the end of every November and the middle of March. It temperatures can be as low as 3 degrees Celsius. Hamarttan is usually caused by heavy amount of dust in the air, it has severely limit visibility and block the sun for several days, comparable to a heavy fog. The sand stirred by these winds is known as the Harmattan haze, and costs airlines millions of dollars as it disrupt their activities which always results to canceling of flight and diverted flights each year. Many Nigerian folks has claimed that during harmattan period men and animals become increasingly irritable when the blows persistently. Generally in Nigeria, it is obvious that Hamattan period is usually characterised with some dreaded dieseases, the Northerners in Nigeria faced this phenomenon heavily compare to the people in the south as a result, it has claimed so many lives. Over the years this phenomenon has resulted into spontaneous nose bleeds, it has negative effects on asthmatic patience, it aggravates cold, it causes catarrh, it causes severe crop damage, a good example is cocoa crop. A couple of days back January 19, 2012 to be precise Financial Times Saharan wind stirs cocoa market; it also caused an eye infection called Apollo, for some people in Nigeria. The change in weather condition this period, according to the Corps, usually occurs when the temperature drops to the dew point of saturated air that condenses to reduce visibility drastically and cut down on the vision of a driver to 400 meters or less thus creating hazardous driving conditions. Consequently, motorists are strictly warned to drive with lights on low beam in view of reflections from high beams that heighten poor visibility ofdrivers. ‘Since the harmattan season has begun, every road user should note that this is the period when the northeast wind blows cool but dry winds from the Sahara desert.